The Conservatives have described reports of a new government data security lapse as "disturbing". An ex-contractor at the Department for Work and Pensions had two discs with thousands of benefit claimants' details for more than a year, it has emerged. The unencrypted discs revealed the type of benefits paid, but a DWP spokesman said they did not contain bank details. The woman told the News of the World she forgot to return them after she stopped working for the DWP a year ago. It comes as the search for two missing child benefit discs containing the personal details of 25 million people continues. The DWP discs in the latest incident contained names, addresses, dates of birth and National Insurance numbers. They were part of a project aimed at encouraging people to switch from a giro to a credit transfer system. It is believed there could be up to 9,000 names on each disc. Shadow work and pensions secretary Chris Grayling said: "This is an exceptionally disturbing new development involving highly sensitive personal information. "The fact that it hasn't been copy protected is further evidence of a cavalier attitude towards data protection in government departments. "Ministers need to explain urgently how they are going to put things right." A DWP spokesperson said the department took the security of customers' data "extremely seriously". "Although there is no indication that any customers' data was compromised by this incident, we are investigating and will ensure the safe return of the information," he added. On 18 October, HM Revenue and Customs sent two discs containing the entire child benefit database, unregistered and unencrypted, to the National Audit Office - but they did not arrive. They were sent by courier from Tyne and Wear to the National Audit Office in London. 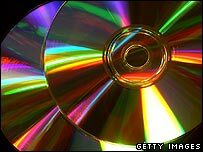 It is believed police fear the discs may have accidentally been thrown out as rubbish. They have visited several tips around London to check what waste was delivered there.